I don't know what can be more classic than a grilled burger. However, they are a food I tend to pass up though unless they are jazzed up with something special. I won't just eat a plain old burger. With the smell of grilling all around me this weekend, I was craving some classics. It seemed only right to have some on Memorial Day weekend. We had burgers and brats. For the burger we roasted a Poblano pepper on the grill and added slices to the layering along with a tomato and pepper jack cheese. I coated the top of my with tomatillo salsa. Salsa love. I should really make my own but we seriously down one jar every time we open one. I would be making salsa every week. Maybe we should just move to the southwest. I think New Mexico would be nice. I don't know Spanish. Would that be a problem? I think tomatillo salsa is my favorite although I like to mix it up. Give me a trio of salsas and I will be dipping my chips in every single one. I cannot believe it is already Wednesday. I am happy and scared all at once. I have a big project at work that needs to be done by Friday. It is going to be one tough push. On the other side, we are half way to the weekend already and that is exciting. Breakfast was frozen whole wheat Van's waffles with nut butter and banana slices with a few strawberries on the side. I had one topped with cinnamon raisin peanut butter and the other topped with Peanut Butter & Co. dark chocolate peanut butter. I like variety. I hate the chocolate one first. Big mistake! It is always better to end with the chocolate side of things. Lunch was a pesto chicken sandwich. I don't do mayo so salad type lunches just don't happen for me. I made some pesto this weekend though. Adding chicken and pesto was a perfect combination for a quick sandwich. Oh yes, a slice of fontina cheese as well. Add some potato chips and carrot sticks and you have a semi-balanced meal. 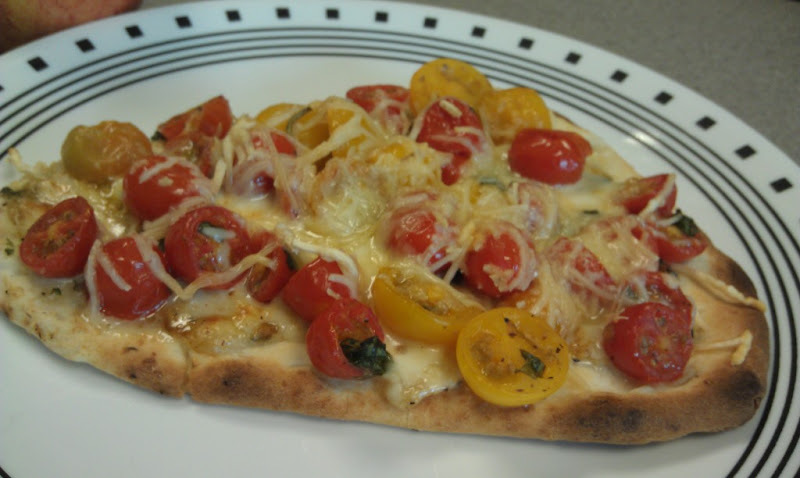 I love being able to come up with better, more delicious ways to re-purpose leftovers. This sandwich really hit the spot. Dinner was a burger. Recipe tomorrow but we had a Tex-Mex version. Tomatillo salsa, roasted Poblano pepper and pepper jack cheese. It was good. Messy. Oh weekend could you please be one more day? I know you gave us an extra one but it was so much fun. And I really, really don't wan to go into work this morning. If you are like me today you know that any little thing you have to get done seems like a mountain to climb. I do not climb mountains. My gift to you then is a quick meal that takes very little effort. You place all of the ingredients in a bag to marinate. The best part is that you only really need 10 minutes, in case you are like me and forget in the morning. You can also let it sit in the fridge over night. You broil the steak for about 5 minutes on each side. Be careful not to start a fire. This is a common occurrence in my house whenever we use the broiler. You can be like my husband and eat the meat straight. I like to actually follow the recipe and have a salad. Makes me healthy, right? The flavor is great. Enjoy your quick and easy meal on what is sure to be a long day getting back into the flow of things. Heat broiler, with rack set 4 inches from heat. In a small bowl, whisk together lime juice, vinegar, oils, red-pepper flakes, and garlic. 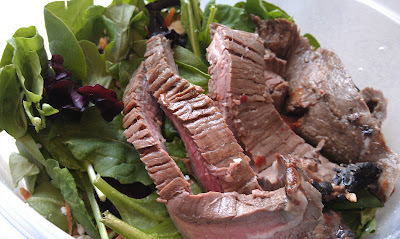 Pierce steak all over with a fork; place in a shallow dish or resealable plastic bag. Pour soy sauce and half of lime-juice mixture over steak (reserve remaining half for dressing), and marinate at room temperature, 10 minutes (or up to overnight in the refrigerator). Spray a baking sheet with cooking spray. Lift steak from marinade (discard marinade), and place on baking sheet. Broil, without turning, until medium-rare, 8 to 10 minutes. Let rest 5 minutes. Slice thinly on the diagonal, across the grain. Do you know that one of the best known foodie cities is Portland, Oregon? I don't know how many articles I have read in the past year that states not only the best restaurants but the best food purveyors, and best in town laws about raising your own chickens. I should move there just so I can have fresh eggs in the morning. I haven't visited but it is on the list. I should some how figure out how to work out of our remote office there for a week. The May Foodzie options were a tough pick. We had a outdoor grilling option, a brunch option, and the Portland box. There were several things in each box that Mr. J and I were eying but in the end Portland won out. Starting with a local supply of all-natural, antibiotic-free pork, Elias Cairo and his team do everything by hand, from expertly butchering the pork to grinding spices in-house. A longtime French favorite, pate de fruit is a little jewel-like confection bursting with fruit. The deep dark purple color comes from the local marionberry, a sweeter, juicier version of the common blackberry. Rich in decadent chocolate flavor with a generous amount of tender coconut, these raw, vegan cookies are made with all organic ingredients and dehydrated at 105, which keeps them soft and chewy. Grown on a family farm in the Willamette Valley, these hearty, earthy nuts are packed with vitamin D, E, and K, and are roasted twice a week to ensure that each batch is super fresh. First available only at their Hot Lips pizza joint in Portland, these sparkling juice sodas (where you can actually tastes the bursts of fresh fruit) now have quite the following. Our favorites would have to be the soda and the hazelnuts. I don't even drink soda regularly and this made me weak in the knees. Before I knew it we had finished the bottle. They are so right when they say you can actually taste the berries. You truly can. I had never had plain hazelnuts till this little package came along.I have been missing out. These had just the right amount of roasting and salt to complement the natural flavors. We might just have to count out the remaining nuts to split evenly between the two of us. It just makes things easier that way. Happy hour with co-workers at my favorite Mexican restaurant. 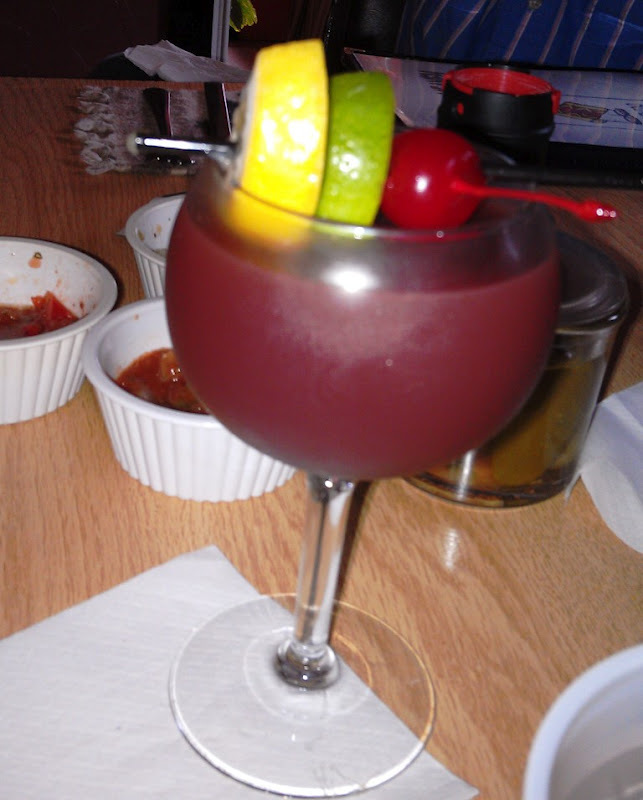 I don't like Margaritas so I opted for Sangria. A trip to the local library to pick up some beach reading. 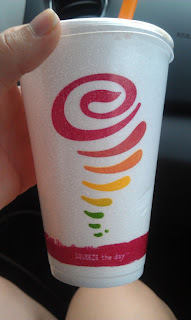 I found a new Jamba Juice approximately 20 minutes from my apartment, next to a Target. A very bad thing. Mr. J had his first Jamba Juice. He loved it. A doubly bad thing. Big time steaks on the grill with the second helping of corn for the year. 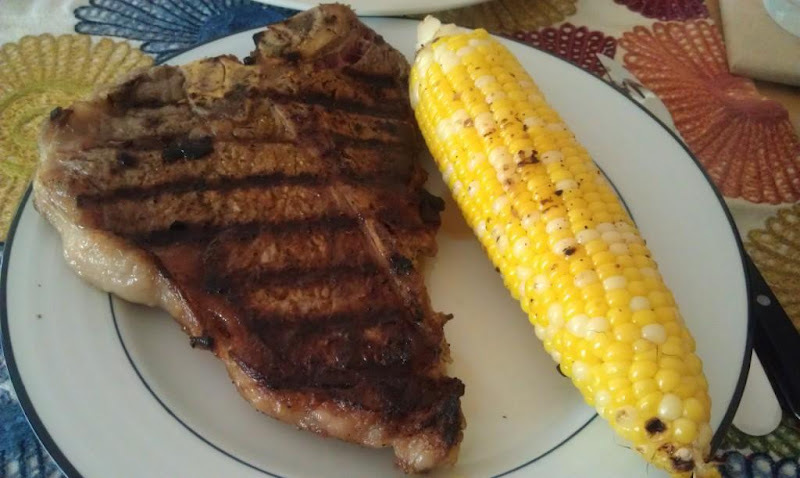 I love the grilled corn. Mr. J loves the grilled steak. 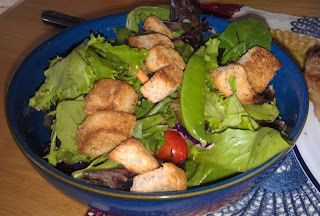 I force feed us both salads to make up for the lack of greens from the past week. Are bodies thanked us afterwards. This week I have had so many random thoughts I just don't know what to do with myself. Mr. J has been in Alaska which makes things difficult. Normally I can tell him my nonsense. He tells me its nonsense and that is the end of it (we do talk). But when he is gone there is no one to talk to....even the phone is difficult because it is 4 hours time difference. That's an awkward time change let me tell you. Right when he is getting done with work I want to be going to bed. Next time I am really going to try to tag along. He said that when he arrived at 9:30pm the other night it was still bright and sunny. That does some weird things to your mind. He had been up for 20 hours straight and still wasn't tired. I hope they have blackout curtains. I will need them. What what is the point? I have all of these plans and ideas and no one to really share them with...so glad I have you. He is set to come home tonight. Due to his long day of travel we will not be taking a big trip for Memorial Day weekend. Instead we have a day trip planned for Western Massachusetts. Basically, I wanted to check out this restaurant so snap and a trip was set. I kind of want to go back to NYC or Boston for a day. I wonder if this could be possible? I think Memorial Day weekend means lobster. I have to have one at some point this week. I might even break down and cook one up myself. This is always my mom's job. I don't mind the thought of killing them. I just don't like to actually stick them in the pot. I am a chicken. Mystic Seaport is having a Lobster Fest. Maybe we should just go there? I have clothes in my closet from middle school. Is this normal? I debate about just giving them all away and starting fresh. I don't know if my credit card would like this idea. Too bad I cannot ask it either. It is suppose to be 90 degrees here tomorrow. My first thought is to bake. 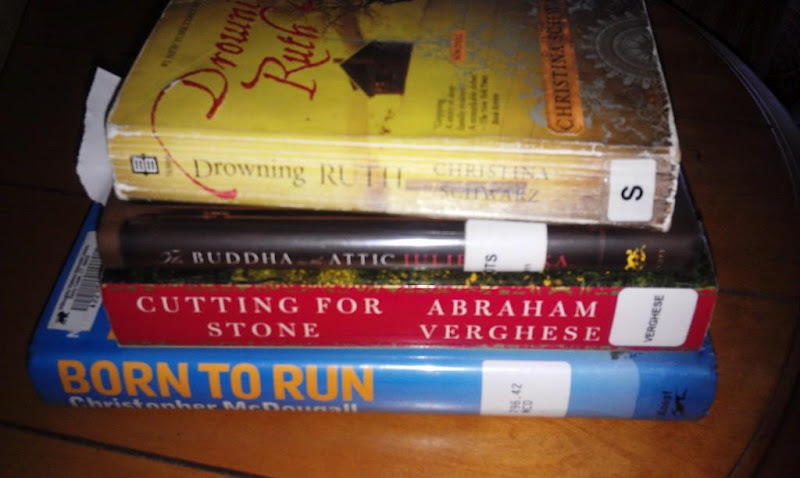 I promised after my cookies and pie last week that I would take a break from the sweets. Clearly that would not go over well for my new wardrobe. But all I want to do is make a chocolate cake and muffins. I will make the muffins healthy. Carrots. Crap. Mr. J doesn't like healthy muffins or chocolate cake. Even more trouble for my new wardrobe. I want to go on about plans for the summer but I will stop here. I hope I didn't overwhelm you. Let's just all hope Mr. J makes it back so you don't have to suffer through another one of these posts. I am not sure what to say about this dish. It was good. It was easy to put together. Mr. J and I like hot and spicy food. Food that is so hot that our eyes start to water and our mouths go a bit numb. Now that is a good time. We have been super busy lately. I know y'all can relate. I am a big planner but lately even my planning methods seem to be failing. I have been traveling; Mr. J has been traveling. Of course, it is never at the same time. Trying to figure out meals and groceries has been difficult. Expiration dates become extremely important. There have been some misses. And it kills me a bit to say that I have had to throw away full bags of food. Not too many, but for me one is too much. This meal was put together in about 15 minutes total. 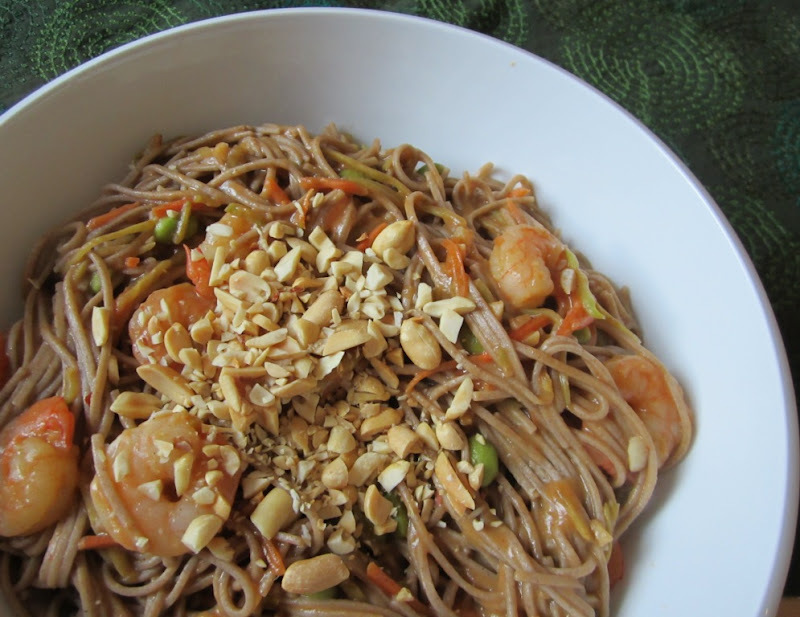 I used a bag of frozen shrimp, shredded carrots, and mixed broccoli slaw. Besides mincing some garlic and mixing the sauce up you just have to wait for everything to cook and that isn't even that long. We ate it hot the first night and then I had two servings leftover that I ate as a cold noodle salad. Both tasted great. I amped up the hotness of this recipe but if you like to be able to feel you lips after the meal you can certainly cut back. Add 2 Tbsp sesame oil to pasta and toss to coat. Set aside. Heat remaining 2 Tbsp sesame oil in heavy pot over medium-high heat. Add green onions, carrots, broccoli slaw, garlic and ginger. Saute until vegetables soften, about 4 minutes. Add pre-cooked shrimp and heat through. Add honey, peanut butter, soy sauce, vinegar and chile sauce and mix well. Simmer sauce 2 minutes. Pour sauce over pasta and toss well. Transfer to platter and serve warm. 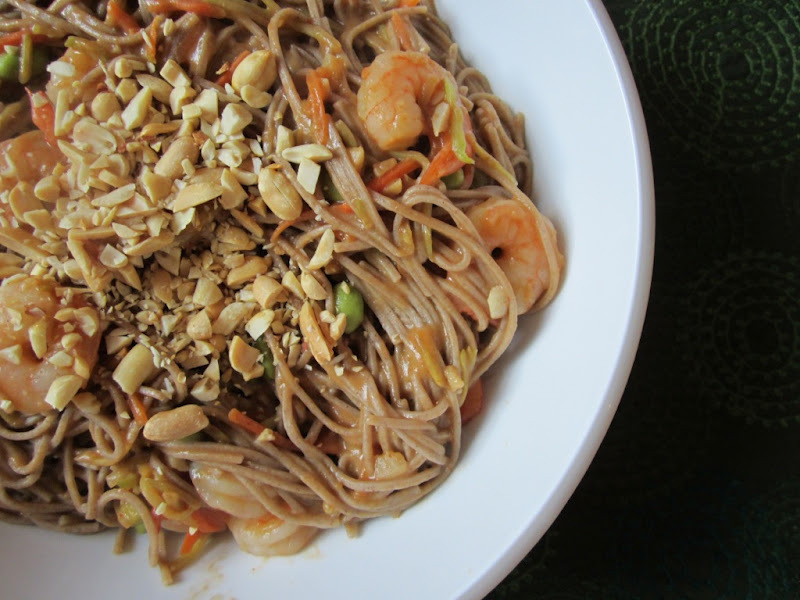 Garnish with additional green onions and peanuts, if desired. There are a lot of things I enjoy about summer but there are two things I really hate: mosquito and humidity. Lucky for me I live in a spot that doesn't get too humid too often. Other the hand mosquitoes are numerous. They love me and I hate them. No matter what I wear or spray on they still find me. Last Saturday I mistakenly took no precautions and ended up with about 10 bites across my legs. Even with out itching immediately I have welts the size of quarters. The worst part is that several of them are around my ankles. I have yet to find a pair of shoes that doesn't irritate my bites. My whole legs begin to tingle and all I can think about is itching my legs. Arg! It has not been an enjoyable last three days. One of the things I love about summer though is the fresh tomatoes and basil. For me that means lots of Caprese Salad. You can prepare several different variations of this dish but the one listed below is the one I find the easiest to make and serve on short notice. 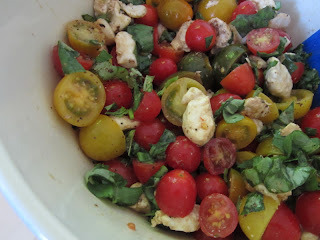 Cut cherry tomatoes and mozzarella balls in half and place in bowl. Twist basil leaves and cut slices. Add to tomatoes and mozzarella balls. 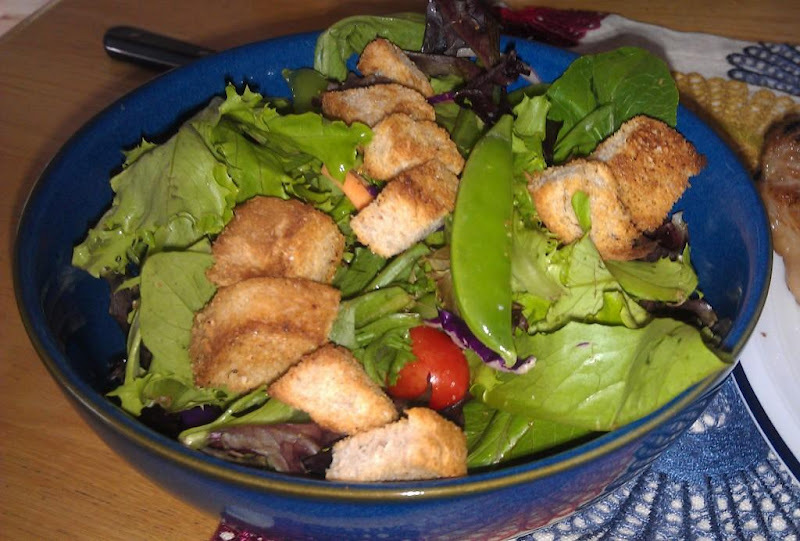 Drizzle olive oil balsamic vinegar over the top of the salad. Toss. End with a sprinkling of kosher salt and black pepper. 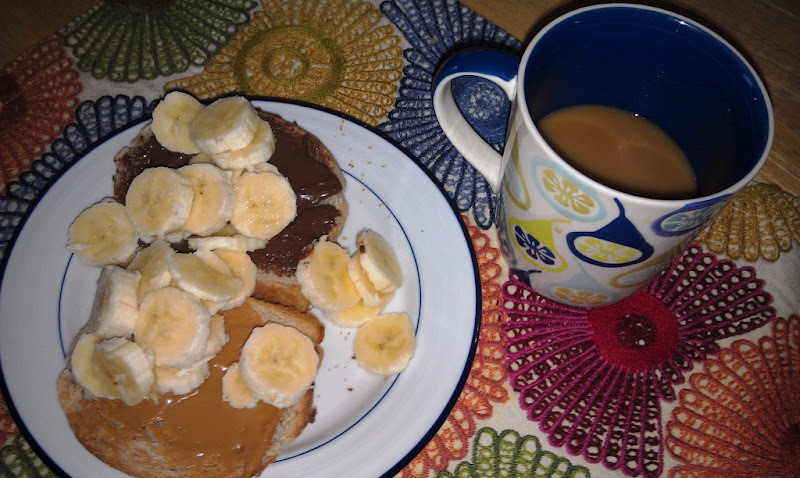 Breakfast was a some homemade toast with Biscoff on one slide and dark chocolate peanut butter on the other topped with banana slices. Served with coffee. Some mornings I just need to start off with something sweet. This hit the spot. 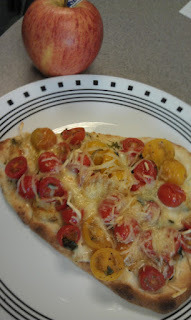 Lunch was a mini pizza made with my favorite frozen Naan bread from Trader Joe's. Topped with some leftover Caprese salad and additional Parmesan cheese. I cooked it up in the toasted oven at work and made every one drool. It smelled so good. I work with several boys men who have only been out of college for a few months. They didn't know what to do with this easy yet delicious meal. I had to chuckle to myself. I had an apple for a snack about an hour after I ate lunch. I couldn't resist the last of the cookies staring me down. I was only planning to have half a cookie but ended up polishing the whole thing down. Dinner wasn't a cookie. We had some Asian marinaded flank steak with sauted kale and green beans. As with other times we have used the broiler, we had a bit of a disaster that included the smoke detector going off three different times. Needless to say I got distracted and didn't get an end photo. I took a break from Pinterest after about a month of non-stop browsing. I went cold turkey. No need for a 12 step program for me. I probably would have needed one though if work had not gotten incredibly busy with non-stop travel. It is easy to quit one addiction by picking up another. Although traveling for work is more forced. I digress. Last week I ease myself back into the Pinterest world. I gave myself a 15 minute limit per day. The first day I found these cookies from the Brown Eyed Baker. A seed was planted. It grew to a seedling the day I supplied candy for a 3 hour presentation I was giving. The candy contained Reese's Pieces. Yes, I do bribe the people I am presenting to (especially CFOs) with candy. I have learned that 1pm meetings for three hours about numbers need candy. They were happy. 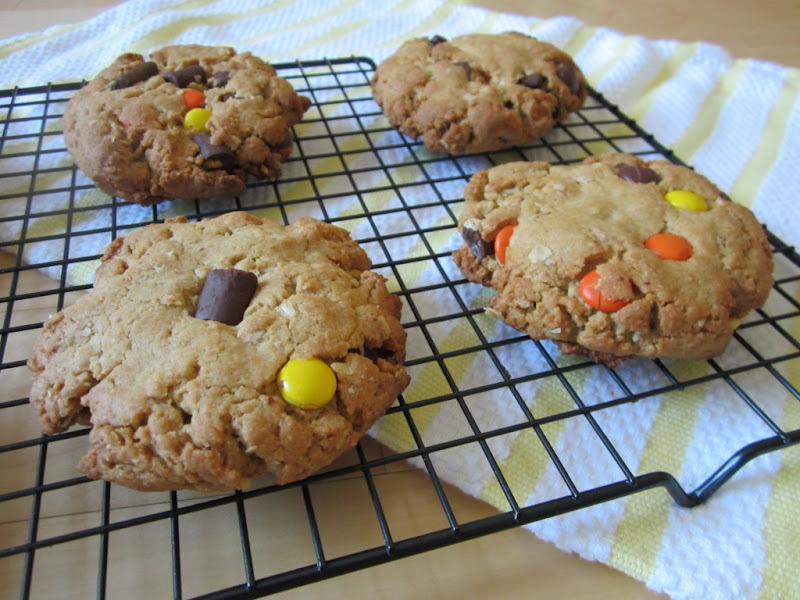 I restrained myself on the flight home from eating any of the precious leftovers in order to make these cookies. I am so glad I did. With an electric mixer on medium speed, cream together the coconut butter, peanut butter, and both sugars until light and fluffy, about 3 minutes. Scrape down the sides of the bowl, add the eggs and vanilla extract, and beat until combined. Reduce the mixer speed to low and gradually add the flour, mixing until it has almost all been incorporated. 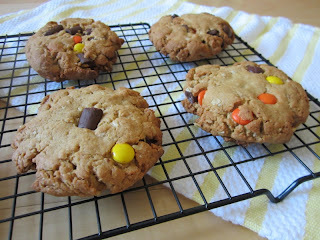 Add the chocolate chunks and Reese’s Pieces, mix briefly until just incorporated. Use a ¼ cup scoop to get a ball of dough and place on one of the baking sheets. Repeat with the rest of the dough – you should end up with about 18 cookies. With your fingers, press down on the balls of dough to flatten into disks, about ½-inch thick. Bake the cookies for 12 to 15 minutes, just until the edges of the cookies are beginning to turn a light brown. Cool the cookies on the baking sheets.